On the pacific coast of Nicaragua, we offer a unique academic semester programme in multicultural pedagogics divided into the two courses Positive Psychology and Learning and Multicultural Pedagogy. The programme is offered in collaboration with Universidad Nacional Autonoma de Nicaragua, León, which is Nicaragua’s second largest public university. Multicultural pedagogy provides the students with the necessary skills and experience to work and teach in a multicultural context. 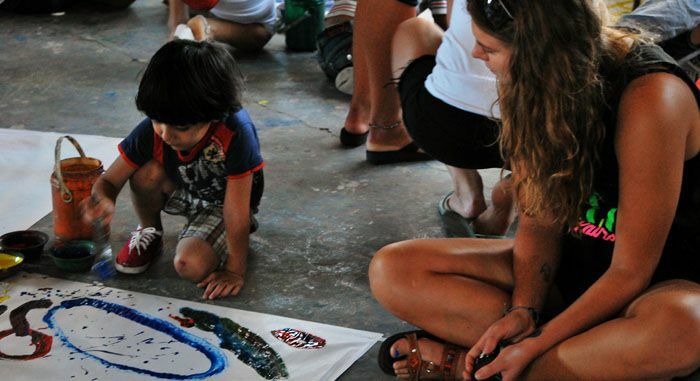 During the stay in Nicaragua, the students will also work as a trainee in schools, kindergartens or other social projects. 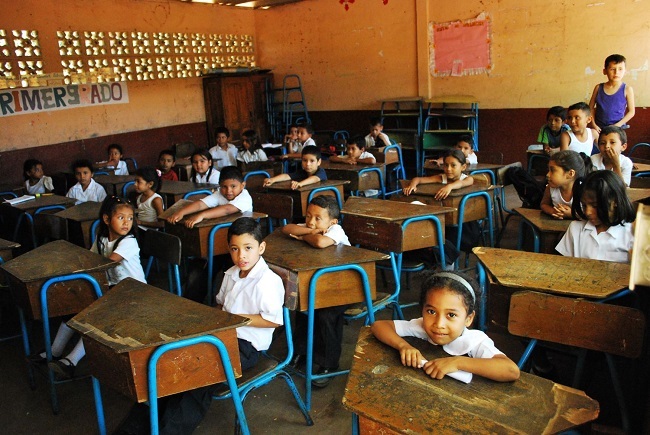 The trainee period in Nicaraguan kindergartens, schools and social projects will establish the basis for further reflections and understanding of multicultural work. We encourage you to combine the two courses of pedagogy with the course in Latin-American studies. However, it is also possible to combine the pedagogy programme with Spanish studies. All the combinations above give the equivalent of 30 ECTS. Combine the pedagogy programme with Latin-American studies. Combine the pedagogy programme with Spanish. Self-study period: Before the study period starts, you are expected to get acquainted with the literature and write a short assignment. The study period in León lasts for 4 months and is a combination of lectures, seminars, group work, trainee period, term papers and exams. The self-study assignment is to be handed in electronically and can thus be completed anywhere in the world. What about writing the assignment and participating in our two-week Spanish beginner’s course in Nicaragua before the study period starts? The university recruit the best lecturers and seminar leaders from all over the world, including Nicaragua. We are very proud of our proficient teaching staff who ensure that students receive the maximum benefits from their studies. 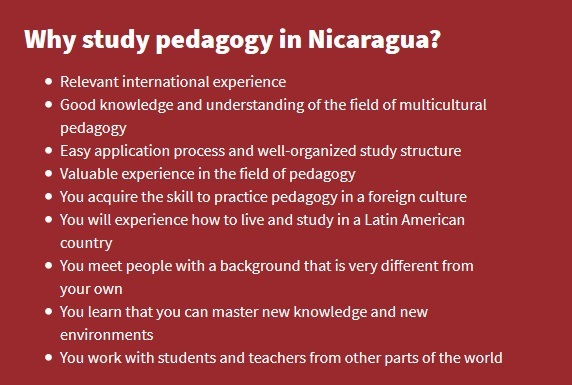 Should you be interested in a full academic year in Nicaragua it is possible to continue with Spanish and Latin-American studies. Universidad Nacional Autonoma de Nicaragua, León, holds the academic responsibility for the programme and issues your study credits at the end of the semester. The university is the oldest and second largest in the country. To apply for the courses you must have university eligibility. Fill in the application form. If there are still places available, we will send you an offer with an invoice for the deposit of 250 Euro. By paying the deposit, you confirm your place in the programme. Leading up to the start of the programme, we will keep you informed about the preparations for travel and studies.